For the first act of Widows, the latest offering from British filmmaker Steve McQueen (12 Years a Slave), I thought I had wandered into a new Michael Mann film. Given we’re talking about crime films, that’s high praise, and not a knock in the slightest. 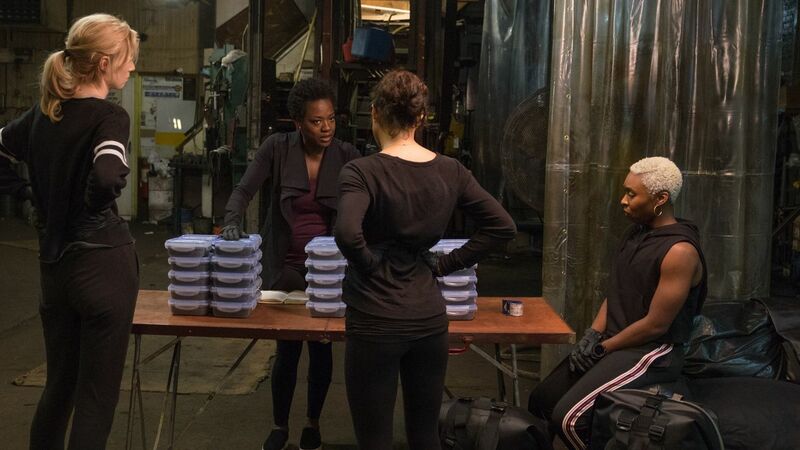 From the Chicago setting to the gunmetal color palette, with thieves betraying thieves and rampant municipal corruption, Widows plays like Mann’s Greatest Hits and to great effect. In the opening moments of the film, a caper goes wrong, and a well-established crew of thieves goes up in flames. Literally. The widows grieve and bury their mates. Veronica Rawlings (Viola Davis), the wife of the crew’s leader, begins putting the pieces of her life back together when a local crime boss and candidate for alderman, Jamal Manning (Brian Tyree Henry), appears unexpectedly in her home. Apparently Veronica’s husband stole two million dollars from Manning, and he wants his money back … from her. Veronica’s husband kept a notebook with all the details of his heists (past, present and future), and the Widow Rawlings needs a multi-million dollar score. Fast. She enlists the services of her fellow widows and … drama ensues. It’s the One Last Job trope with a twist: these ladies have never pulled off their first heist much less a final one. Widows is damn-near flawlessly executed. With a 129-minute runtime, there’s almost no fat on these celluloid bones. Film editor Joe Walker keeps the action moving at a clip. McQueen and his cinematographer Sean Bobbitt seem to conjure compelling visuals at will. Sometimes it’s just a matter of POV like filming a car chase through the back doors of a fleeing van. Simple, but effective. The film avoids the one trap into which so many crime movies fall: style with no substance. One crime film after another offers a slick veneer with tough-guy jargon and atmosphere to burn only to populate its cinematic landscape with characters the audience cares nothing about. Not so with Widows. Our crew of female criminals are flesh-and-blood women, giving the film both scale and stakes. Viola Davis has become so reliable as an actress that she’s entered that Meryl Streep category where you would be surprised if she wasn’t firing on all cylinders at all times. And while her performance anchors the film, it’s the lesser-known names that will lodge in your memory. Elizabeth Debicki shines as a stork-like, awkward beauty who has come to expect abuse from her mother and husband alike, yet finds the resolve to stand on her own two feet. Cynthia Erivo proves that her breakout performance in Bad Times at the El Royale was no fluke with her portrayal of a babysitter turned getaway driver. And lastly, a shout-out to a male member of the cast, Brian Tyree Henry, who turns in a perfectly-modulated performance as a local crime boss. He clearly understands that you can chew the scenery and dominate the screen without relying on a bunch of melodramatic histrionics. Thanks to a wicked case of bronchitis my review of this film is a bit tardy. That inadvertently allows me to check the weekend box office and see just how badly Widows under-performed on its opening weekend. So, those of you who appreciate literate adult entertainment, get out there and support this film with your dollars. If you don’t, you’ll soon be spending your time watching nothing but superheroes and Disney animation. And that would be the biggest crime of all.